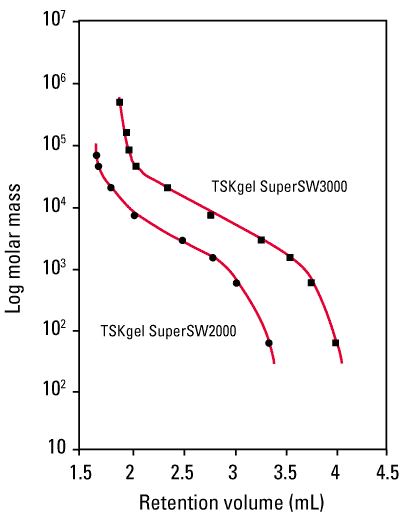 TSKgel SuperSW columns, introduced in 1997, have become synonymous with analyzing protein molar masses in the emerging field of biotechnology. 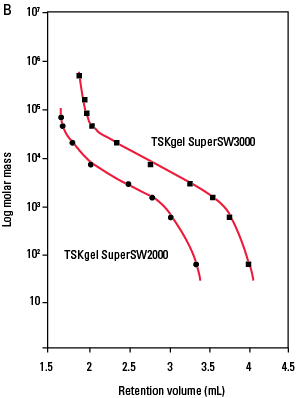 TSKgel SuperSW columns contain smaller particles than TSKgel SWXL columns; 4 micron versus 5 micron. In addition, the column internal diameter has been reduced from 7.8 mm ID to 4.6 mm ID to provide higher sensitivity in sample-limited cases and to cut down on solvent use. It is important to employ a UHPLC system or an HPLC system that is optimized with regards to extra-column bandbroadening to take full advantage of the high column efficiency that can be obtained on TSKgel SuperSW columns. See SEC Columns Brochure for recommendations. The figures show the calibration curves for globular proteins (A) and for polyethylene oxides and glycols (B) for TSKgel SuperSW columns. Tables within the tabs below summarize the molar mass ranges for the TSKgel SuperSW2000 and SuperSW3000 columns for globular proteins, polyethylene oxides and dextrans that can, at least partially, access the particle pores.